Following their breakthrough in 2006, in 2010 the Greens in the Czech Republic (Strana Zelených) did not cross the 5% parliamentary threshold and lost both their seats and state funding. Without getting money from the State, the party and its members had to find alternative means of funding their activities. In 2011 Tomáš Průša, formerly the party’s Secretary General, and Ondřej Liška, currently the party’s Chairperson, opened a new café with the ambition to support the party by giving from 7 to 10 % of the café’s revenues to the party. However the café remains legally independent of the party, as is required by law. The café will not only be a financial help to the Greens, but also a place for public meetings of the local Greens. You can find the headquarters of the party in the same building. However, the process of establishing a café can be quite difficult. It requires a level of upfront investment which can be quite high, and in this case the investment was from a private investor, who in addition donates 10% of his profits to the Green party. So while this is a wonderful idea, it’s neither a quick-fix nor easy to repeat, as it requires good circumstances. “Actually it is not a Green Party’s café as much as people think. It is just a café where you can meet your politicians and see that ethical and ecological business is possible,” says Tomáš Průša. According to his estimates, about 80% of the visitors are aware of café’s association with the party. There are some green publications available, and many seminars and meetings take place there. It is important for the party to have an attractive venue for events, but hiring a venue can be prohibitively expensive. At the moment, there is only one party office left in Prague and the basic organisational meetings often take place at the café. Thus, the café has become a perfect additional venue with big windows and nice simple design. For example, the café recently hosted a party seminar on the educational system in the Czech Republic, and another on energy policy. 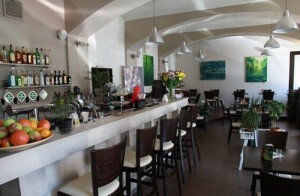 Tomáš Průša also states that the café will be used for the party’s next election campaign. However, even people who do not vote for the Greens or are generally not interested in politics use the café. There are many businesses in the neighbourhood and during lunch time the café is crowded with people from all walks of life. The food is high quality but affordable. The staff use eco-cleaning products and the café runs on renewable energy. Besides the political events, the café is also a space for local culture. The walls are used to display art by young (not only) Czech artists. The café has already hosted two art exhibitions and a third is planned in the near future. Currently, you can see an exhibition against racism. “We want to support young artists who can also sell their works here,” says Tomáš Průša. Currently there are about eight people who work at the cafe. In the future the owners are thinking about hiring disabled people and immigrants who have problems with integration to raise awareness of these issues. Tomáš Průša says that they have already talked about the cooperation with the centre for immigrants in Prague. Six months after the café was been launched, the place is getting more and more visitors, and since January it has started to turn a profit. But there is still a lot of work to do. “For the moment, it is very important to find the right people who will work here,” say Tomáš Průša. “We need to be nice and open to people to gain their trust. It’s a lot like in politics.” So far, the café seems to be a model that other greens can follow. It not only supports the party financially, but provides a spacious venue and pleasant atmosphere for green meetings and discussions. “Politics have become separated from the people, and our philosophy is to return politics where they belong, i.e. among the people, linked with life and the world as a whole,” said Ondřej Liška in the interview with The Prague post.